In a recent letter to enthusiast web sites, Ford's reportedly requiring the relinquishment of all Ford trademarks including domain names, banners, signs and merchandise as well as a restitution payment of $5,000 by December 19th. 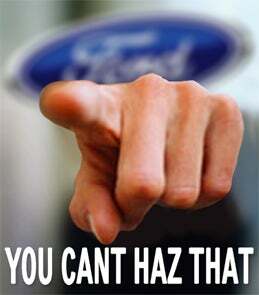 The days of the Carpocalypse are upon us and Ford is now taking it to the internet, web 2.0-style. In a recent letter received by enthusiast sites including, TheRangerStation.com, Ford is requiring the relinquishment of all Ford trademarks including domain names, banners, signs and merchandise as well as a restitution payment of $5000 by December 19th, 2008. Enthusiast sites that have received a letter from the Howard, Phillips and Andersen legal firm will be required to promptly remove all FoMoCo-trademarked material and are threatening a $100,000 lawsuit on top of the aforementioned restitution payment. Ford claims the unofficial use of their trademarked names are damaging, which we don't buy. The one thing we would buy is the desire to keep others from profiting from the Ford brand in the form of merchandise. But we're wondering whether Ford's lawyers should really be going after enthusiast web sites right now when they need friends anywhere they can get them. Of course, maybe we're on the wrong track of thought here — maybe we should be thinking they’re looking to make a buck any way they can? Or could Ford be concerned the leveraged-to-the-hilt logos won't be worth as much to the automaker's growing corps of creditors? More than likely it's just another case of the lawyers not understanding what the value of positive PR is.